Here is our most wanted videogame controller of 2008 to date – the Gene Simmons' Axe Guitar controller. 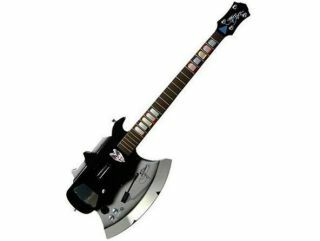 This uber-guitar will let you rock out with both EA's Rock Band and Activision's Guitar Hero, which is more than can be said for some of the 'official' peripherals on offer right now. For Kiss fans, this is clearly a must-buy item, as it features Gene Simmon's signature AND a picture of Mr Simmons pulling an angry rawk face on it. It features the usual bits - a bi-directional strum bar, ultra-responsive fret buttons and an analogue whammy bar – but (and this is the real killer USP here!) it looks like a massive killer axe. It is available later this week for $80 on Amazon.com for PS3, PS2 and Wii, but not for Xbox 360, somewhat surprisingly.